When we first bought our house, we had no idea what we were doing. We were overwhelmed — not just by the house, but by the yard as well. While I’d grown up mowing the lawn every weekend at my parents’ house, it had been decades since I’d had a yard to deal with. And this one was getting out of control fast. We didn’t own a lawn mower when we moved in, but the previous owner had left an electric weedwacker in the garage. And so one of the enduring memories that would come to define our first week in our new home is of me haplessly weedwacking the entire front lawn like some kind of jackass. It was ridiculous, but it got the job done until we could track down a mower on the cheap. We eventually bought a very used Craftsman electric mower from a guy in Dorchester for $20, and thus began my appreciation for electric lawn mowers. I was able to fit the whole thing into my tiny Kia Rio — and without spilling gasoline all over the car. What’s more, that thing did a bang-up job cutting our grass for another three full seasons before it finally quit. When it did, I bought the newer model for under $200 and we’ve had that since. So yeah, I prefer electric lawn mowers to their gas-powered brethren, for two big reasons: They’re better for the environment, and they require way less maintenance. Most Americans use gas-powered lawn mowers and leaf blowers, but their two-stroke engines are simply TERRIBLE for the environment. A typical gas leaf blower emits 299 times as much pollution as a Ford 150, and using a gas mower for an hour emits as much pollution as driving 100 miles. That’s not to mention the deafening roar they make. But in Greater Boston, where most lots are measured in square feet and not acres — the median lot size of a single family home in Boston is 4,899 square feet — there’s no reason not to plug in your mower. An electric mower is also a lot less of a hassle. You don’t have to remember to keep gas and motor oil on hand, deal with spark plugs or carburetors, or any of that stuff. You just plug it in. The only maintenance I’ve ever done on my electric mowers was to sharpen the blades every couple of years (which you should do with any mower). Tune up the lawn mower: Start the season with new air and fuel filters and a fresh spark plug, then change the oil and add a fuel stabilizer. In electric models, clean the air vent. If you’re keeping score, a gas mower requires you to do five separate things, including replacing spark plugs and draining and changing the oil. I have no idea how to do all that. With an electric mower, you just have to clean a vent. That I can handle. So why aren’t electric mowers more popular, especially in our increasingly eco-conscious world? 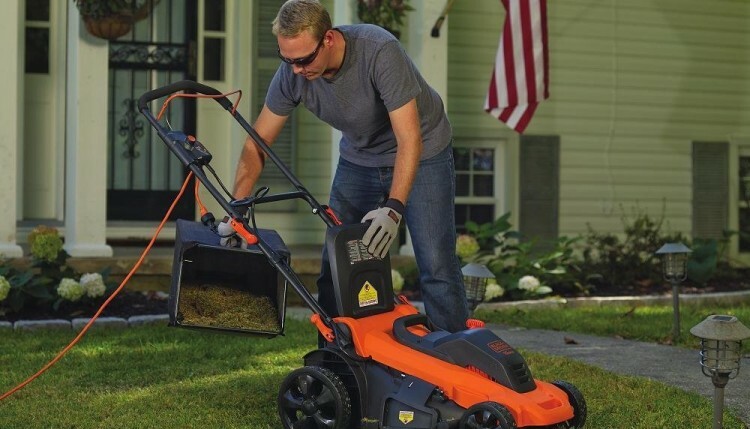 I think the biggest obstacle is that men have traditionally done the yard work around the house, and mowing the lawn with a big, noisy gas motor feels manly. That’s to say nothing of riding on a tractor-style mower. But when you mow the lawn plugged in, and you’re going back and forth in straight lines and yanking the cord out of the way… I’ll be honest, it feels a lot like you’re vacuuming the yard. Which, okay, doesn’t feel as manly. But who cares? It’s time for people to get over it! Plus, it’s certainly more impressive than wandering around the yard wielding a weedwacker. The sweet spot: How long can you go between turning off the heat and turning on the A/C? It’s that vacuuming feeling of our electric lawnmower that I love — it is so effortless that I feel like doing it in long skirts and singing Mary Poppins songs. Compared to dragging around the weight of my former gas mower and choking the entire time from the gas fumes (the reason we went electric), mowing is now fun. Thanks for a funny and spot-on post!